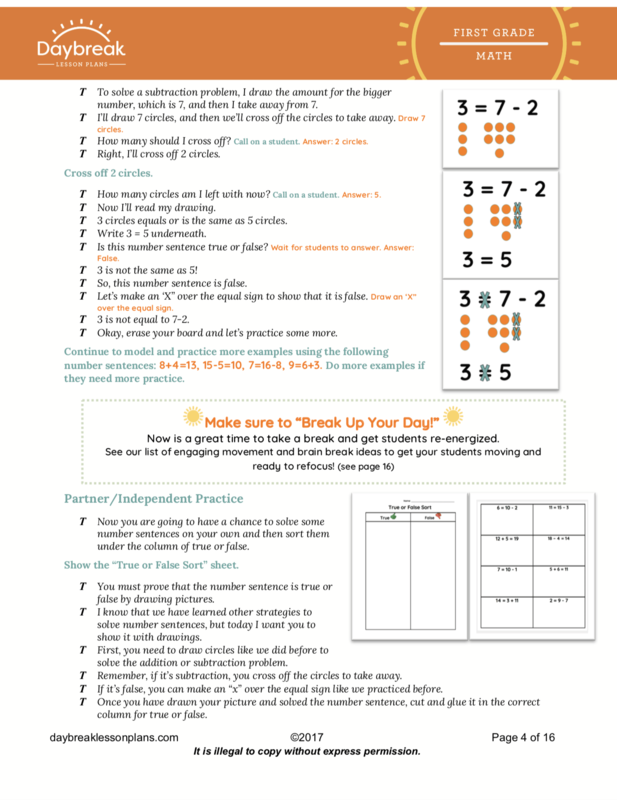 Skills: Students will practice understanding the value of the equal sign, collaborate to solve problems of addition and subtraction within 20, determine if equations are true or false, and play a Matching Equations Memory Game. Materials Needed: Pencils, crayons/colored pencils, student white boards, dry erase markers, erasers, document camera or whiteboard, and 8 ½” x 11” construction paper or colored paper. 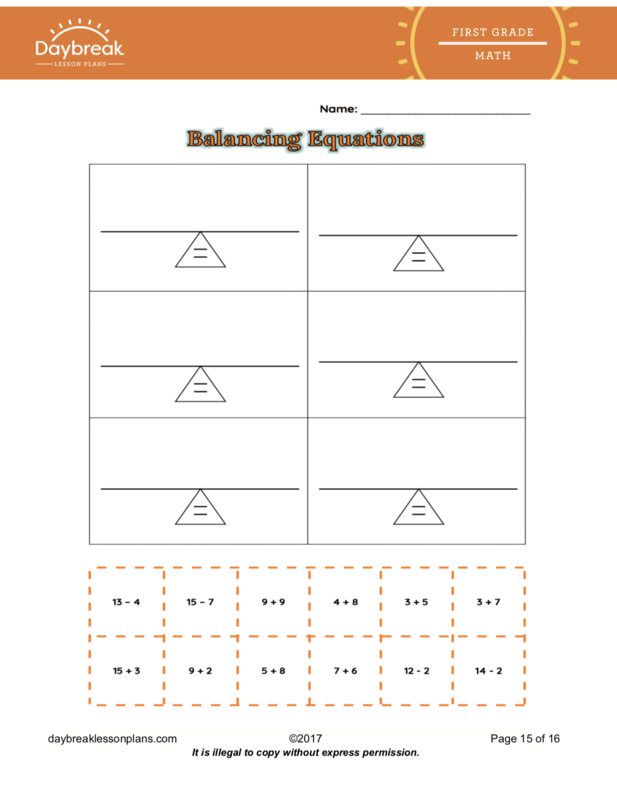 Printable Resources: Required Printable Resources: “True or False Sort”(1 copy per student), “Matching Equations Memory Game” (1 copy per pair of students), “Balance the Scale Craft” (1 copy per student) (1 copy for display) and “Balancing Equations (1 copy per student). Optional Printable Student Resources: “Exit Slips” (1 copy per student) and “Break Up Your Day” brain/movement break ideas. In this 1st grade math lesson for Operations and Algebraic Thinking, students will practice understanding the value of the equal sign and solve problems to determine if equations are true or false. 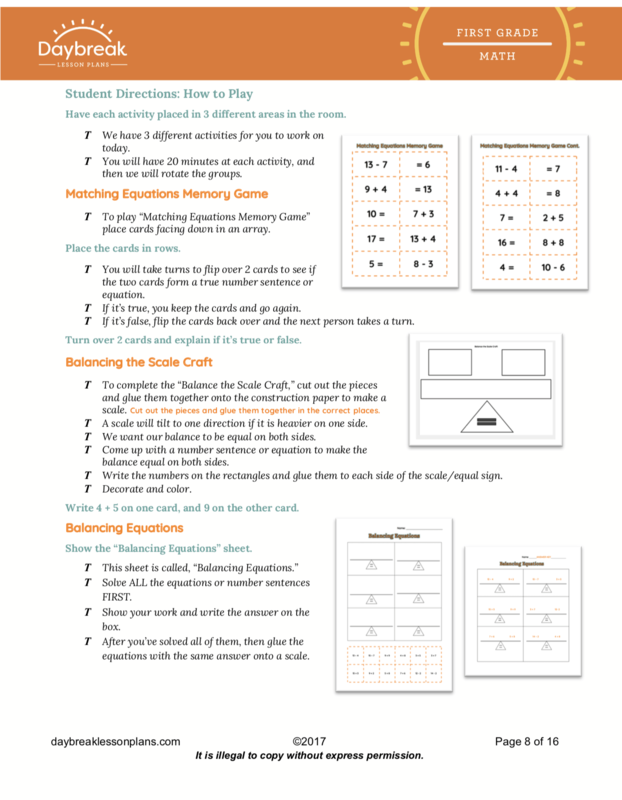 They will work collaboratively solving equations for both addition and subtraction and demonstrate their understanding of the concepts by playing a matching equations memory game. In segment 1, the students will explain what the equals sign means and solve equations (on both sides of the equal sign) in order to determine if the number sentence is true or false. In Segment 2, Students will continue to solve number sentences with the equals sign shown on both sides of the equation. They will match equations to sums and differences as well as write equations that are equal to each other. 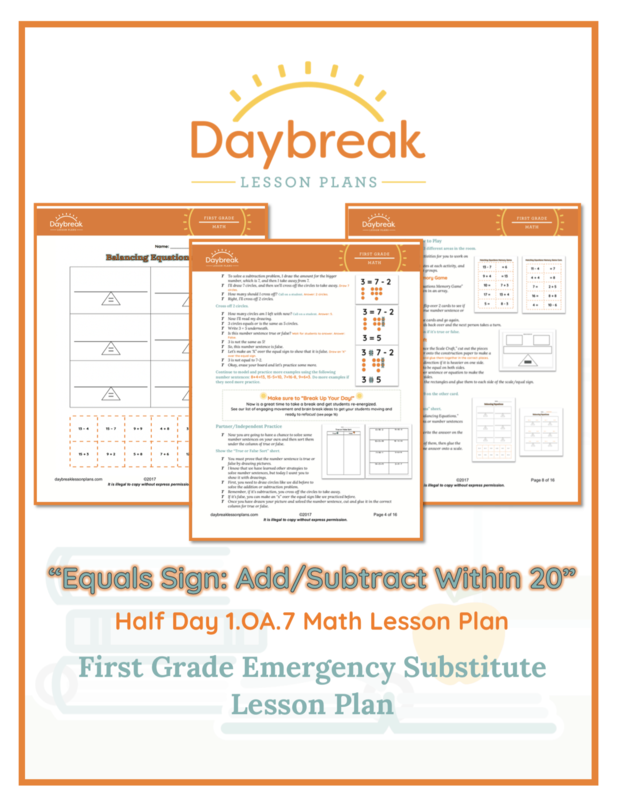 This lesson includes exit slips for each segment that will provide valuable instructional information to you regarding your students understanding of the equal sign and addition and subtraction within 20.